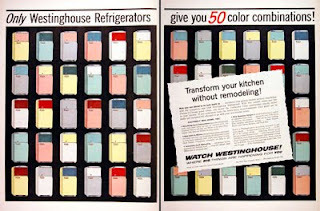 What does it say about our domestic culture that we have gone from a freewheeling appliance palette of 50 colorways in 1956 to the triumvirate of white-black-stainless in 2009? Is it a sign of being a sadder but wiser society? Or do we now focus more on technology than appearance? KBCULTURE solicits your theories, thoughts and opinions. I think it's a result of becoming more sophisticated on one hand (stainless = class) and it's from a sensitivity to falling from fashion too quickly. I think the avocados and harvest golds made everybody gun shy. It is easier for manufacturers to follow Henry Ford's "any color you want, as long as it is black" idea. Even today's car colors are simple and safe. But for many new products, customization is the future. These days, people want to express their personality. TurboChef now offers their ovens in pantone colors for an upcharge. I think as long as current homeowners still remember harvest gold and avocado (and let's not forget coppertone), mass production will stick to "safe". Will that apply to the next generation of homeowners? I don't think so. They grew up with white, bisque, stainless, and black. I can hear them now: "Borrrrinng." They're already familiar with customizing their laptops and phones. Why not appliances? This is not the answer to your question that I had hoped to write — maybe later — but a comment on the ad itself. It's clever how they made fifty choices look like sixty. All the choices are visible, but it seems like there might be ten more. Because of the printing, computer scanning, resizing, and conversion to jpg, the colors vary a lot more than they originally did. Here's the color scheme I came up with: 1) aqua, 2) gray, 3) peach, 4) white, 5) yellow, 6) light blue, 7) darker blue, 8) green, 9) red, and 10) maroon. The first five are base colors, i.e. back and lower door, while the top doors make use of all ten. So, five of the refrigerators are solids (two of them partially covered by ad copy) and forty-five two-tones. With the same paint and the same general method they could have produced one hundred choices (10 X 10), but had the good sense, I suspect, to realize that many of those fifty missing combinations (maroon with a small aqua door, for example) would have been difficult to swallow. 1. Smeg refrigerators come in black, blue, cream, lime green, orange, pastel blue, pastel green, pink, red, and silver. I believe there have also been limited editions. Of course, Smeg's appeal is retro. I'm sure there's a university department somewhere devoted to the hermeneutics of color in contemporary society. It's an enormous and esoteric subject. Without knowing it, we juggle the meanings of a vast array o colors in our heads almost every moment of the day. Chuck mentions Pantone. Their site is worth joining and spending some time at. An entire industry exists — Pantone is only the tip of the iceberg — to establish the colors for each season, occasion, individual, and to differentiate them from past seasons, other occasions and different individuals. A wonderful example of this is the encounter between Maranda Priestly and Andy Sachs in The Devil Wears Prada where Andy says that both belts look exactly the same and then adds, "Y'know, I'm still learning about this stuff." "This... 'stuff'?" Maranda begins, "Oh... ok. I see, you think this has nothing to do with you. You go to your closet and you select out, oh I don't know, that lumpy blue sweater, for instance, because you're trying to tell the world that you take yourself too seriously to care about what you put on your back. But what you don't know is that that sweater is not just blue, it's not turquoise, it's not lapis, it's actually cerulean. You're also blithely unaware of the fact that in 2002, Oscar De La Renta did a collection of cerulean gowns. And then I think it was Yves St Laurent, wasn't it, who showed cerulean military jackets? I think we need a jacket here. And then cerulean quickly showed up in the collections of 8 different designers. Then it filtered down through the department stores and then trickled on down into some tragic casual corner where you, no doubt, fished it out of some clearance bin. However, that blue represents millions of dollars and countless jobs and so it's sort of comical how you think that you've made a choice that exempts you from the fashion industry when, in fact, you're wearing the sweater that was selected for you by the people in this room. From a pile of stuff." 2. We expect color and discussions of color in clothing, perhaps not so intense as Maranda's discussion, because we seldom take clothing for granted. By nature, we judge all books by their cover, denying vehemently that we do so. If Chuck were right about car colors being simple and safe, the automotive world would be as dull as Henry Ford's dictum suggests. The fact that colors fall within ranges — those ranges are the historical result of enormous trial and error — does not mean that minute variations within the range are not the fiercely contested battlefield of manufacturers and marketers. This sounds ridiculous on the face of it, but hotrodders can tell at a glance when a Ford has been painted in a Chevy color — it stands out like a sore thumb — and God knows if the next Maserati Quattroporte or Bentley show car is released in cerulean or celadon, all hell will break loose. Every pricey new car on the road will end up with colors that lean ever so slightly in their direction. Color has meaning, even if we don't have words for it, even if it seems so vastly complicated no one could possibly understand it. Cars and clothing are things worn in public. People judge us by them, and their judgments are deep and complicated. Even if they say they don't. Kitchens were once adornments for housewives, and housewives adornments for husbands. Of course, the word "housewife" now has a demeaning sound to it. Kitchens formed family identity. In societies where servants are plentiful, the kitchen's appearance, the quality of pots and pans, even the need for comfort and workability is of little or no interest. The dining room, the place of consumption, rather than the place of preparation, becomes central. Obviously, Leslie and the people who read this blog love kitchens — and bathrooms. The modern Americanized world, however, has left the old meaning of kitchen far behind. Wonderful kitchens, oddly enough, are like fine mechanical watches — an anachronism. They are somehow nostalgic, like fountain pens or Tuscan fantasies. They seek to restore something, to imitate something imaginary, or to preserve something increasingly unnecessary. 3. R.M. Schindler designed houses in the 40s and 50s with postage stamp kitchens. He thought that his modern clients would be far more involved in living their lives than in cooking and preparing food. He seems like a prophet now, but he was wrong for a long time. The people who owned his houses surreptitiously upgraded their kitchens. They added burners and increased the size of their refrigerators. Sometimes the dining area (the food consumption area?) was gobbled up by the new kitchen. Since then, the production of fast food has dwarfed the production of actual meals in actual kitchens. We are approaching Schindler's dream, where a refrigerator and a microwave, some disposable flatware and a roll of paper towels can speed us through the process of nourishing ourselves. Or, perhaps, poisoning ourselves. And the time we have left? The time we have left we can spend with our iPod, iMac, iPhone, plasma TV, and GameBoy. Not what Schindler had in mind, but things that can be lived with canned drinks and prepackaged foods. If the decline of color in the kitchen means anything at all, it means we no longer judge people by their kitchens. If kitchens were central to our lives, not merely central to this readership, fifty color combinations would be hundreds too few. We upgrade microwaves, but we do so without having to worry about their color. They come in white, black and chrome, just like the predictable background of our kitchen appliances. The thing that manufacturers have learned to focus on is getting one of each (stove, oven, sink, dishwasher, etc.) into every kitchen without calling too much attention to the process. We now measure homes in diagonal inches, by the number of videos they contain and by how many cars and trucks they come with. Ask the poor what they would wish for and they are likely to say, "A big house with a huge driveway and ten cars. And the biggest TV in the whole world." To which we should probably add — and home delivery. There's a wonderful line in the movie Pleasantville (Tagline: Nothing Is As Simple As Black And White) where the paragons of the town are huddled together against the inevitable encroachment of rain and color, when Big Bob says, "Well, we're safe for now. Thank goodness we're in a bowling alley." 4. I just put the kettle on for tea. Perhaps this kitchen will be safe for a few more years. evan, you need your own blog dude..
Reader/writer Evan has fallen quiet for some time; I'm happy to see that his comments are still being appreciated years after he posted them. Perhaps he will rejoin the conversation. I hope so. And thanks to you, Anonymous, for your support!